Earlier this week we were debating whether or not to head out of town for Memorial Day. If you haven’t already guessed from the title of the post, all roads are leading to Wisconsin. Just where in Wisconsin we were going took a while to figure out. Our initial thought was to stay a couple nights in Door County, because we’ve been there before and had a great time. The only problem is that it’s nearly 5 hours of driving and we weren’t sure we wanted to be gone for two nights, so we started debating nearer options. Milwaukee is great, but we were just there last fall, and there’s a cool poster exhibit we’d like to see that doesn’t open until June 1, so we’ll save that for another weekend. Then the small town of New Glarus came to our attention, by both a friend and a recent magazine article. Pros, cons, driving distance, activities and cost were weighed in a lengthy, late-night iChat conference and New Glarus won out in the end. We’ll save our return trip to Door County for the fall. If you’ve ever heard of New Glarus, it is probably for being the home of New Glarus Brewing Company. Any beer drinker who’s been to Wisconsin knows their most popular beer, Spotted Cow. What I didn’t know is that due to its well-maintained Swiss heritage, New Glarus was closen to be the future home of the Swiss Center of North America, beating out New York, Chicago and Toronto for the honor. Pretty impressive for a town of about 2,300. Sources tell me that traditions like yodeling and flag tossing are alive and well in New Glarus … fingers crossed! This weekend also happens to be their annual Music Festival. I was hoping for some polka, but I don’t see any on the schedule, hopefully someone in New Glarus can fire up an accordion for the occasion. 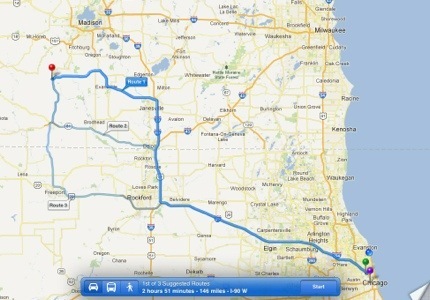 After all that, we’ll drive the short distance to Madison for its nightlife and wider hotel selection. State parks are in the plans for Monday before returning to Chicago. This entry was posted in Maps, Upcoming Travel and tagged Memorial Day travel, New Glarus, Spotted Cow, Wisconsin. Bookmark the permalink.